Discussion in 'Downhill & Freeride' started by ZHendo, Mar 1, 2008. I'm getting ready to order up a few things from Straitline, one of which will be a set of levers for my Juicy 7s. I've been trying to decide on colors, which has been very hard, and I've finally decided that I'd like to try and get blue to match it to my DHX's ano parts. It may seem like a stupid question, but for those of you that have seen the Straitline levers in blue, is it the same color as the DHX adjustment knobs or is it darker? It's hard to tell from pics online. indeed it has, i hoped i wouldn't have to fall to that level, oh well. Dont listen to him, he's getting I9s for his bike! And me, my whole DJ bike is matching. Sorry I cant be of help though. That bike is pimp! Nicest cowan I've ever seen. P.S. - how do you like the fork? 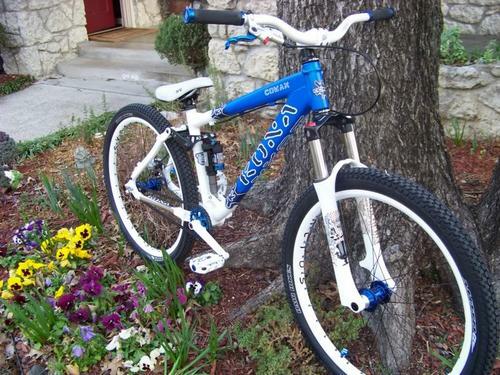 I just got one, but haven't had the chance to ride it cause I came down with the flu. How much air do you have in the pre-load? For as much as i hate this white fad, that bikes looks so good. Maybe im just used to seeing the entire bike being white but damn thats nice.